Winter moth caterpillars started hatching on Sunday, April 19th. Many blueberry and apple growers sprayed insecticide over the weekend, protecting flower buds from winter moths. Today we are getting heavy rain and there are still many winter moth eggs to hatch. Will insecticide applied over the weekend last through all winter moth eggs hatching? Good question! Rule of thumb tells us that pesticides last for up to 2 inches of rain. Following this rule, winter moth caterpillars should continue to be killed after today's rain. I admit I am worried about apples and blueberries having sufficient insecticide coverage after today, especially in areas with high populations of winter moths. So what to do - if you haven't sprayed yet, I suggest you apply an insecticide Tuesday or Wednesday. If you did already spray and you know you had a high winter moth population last year, consider applying another insecticide Tuesday or Wednesday. If you don't think you have a lot of winter moths - if you didn't have problems last year - I think you don't need to spray. Once winter moth caterpillars are inside buds, you can't control them with an insecticide until close to bloom - probably in early May. 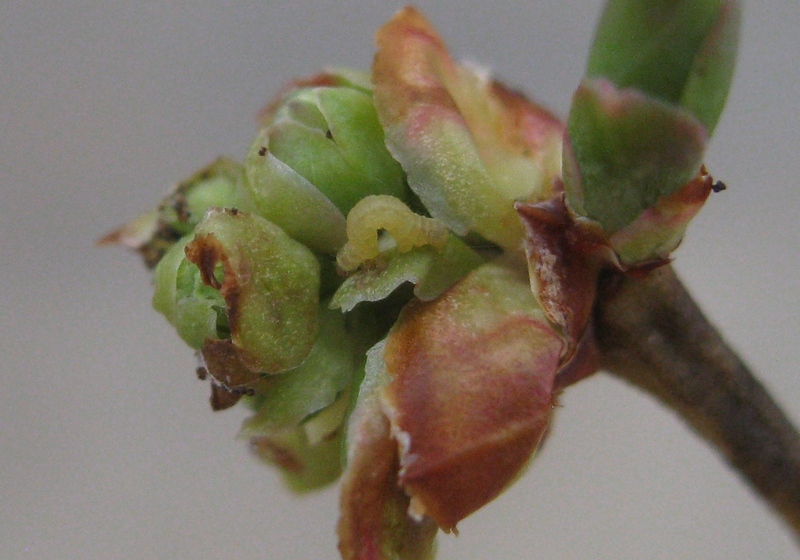 When flower buds expand but before blossoms open (apple and blueberry 'pink' bud stage), winter moth caterpillars move around and are once again susceptible to insecticide applications. At this time, Bt insecticides such as DiPel are also effective controlling winter moth caterpillars. The way to determine if a pre-bloom spray is needed is by inspecting your flower buds starting in about one week. You will need to dissect buds and see if there are winter moth caterpillars inside. ID/Disease Cycle: The first symptom of this disease is browning along the major leaf veins on newly emerging leaf clusters. The leaves wilt quickly and bend to resemble a shepherd's crook. 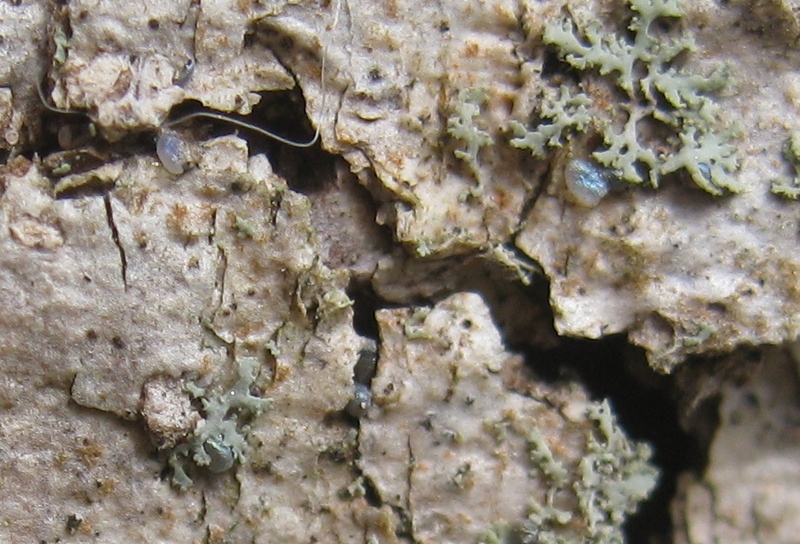 A light gray powdery layer of spores develops at the leaf base. These spores go on to infect flowers and fruit. Infected green berries appear healthy but cutting them open reveals a white fungal growth inside. When berries start to ripen, infected berries appear pinkish tan and slightly ridged. They feel rubbery and contain a gray to black fungal mass inside. Infected berries eventually become faded, shrivel up, and fall to the ground. After the fruit skin has weathered off, the berries look like tiny black pumpkins. The fungus overwinters in the mummified fruit on the ground. 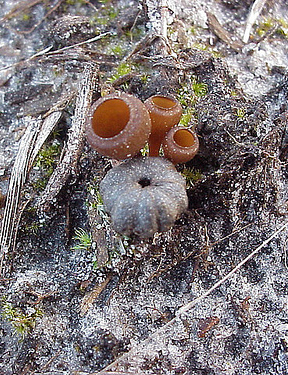 In early spring, trumpet-shaped mushroom cups produced on the mummies eject windborne spore that infect young shoots. Frost may increase susceptibility of blueberry shoots to infection. Spores are produced on blighted shoots and are carried to flowers by wind, rain, and insects (bees), resulting in fruit infections. Mummies that fall to the ground provide inoculum for the disease in the following year. Damage: The fungus infects and invades the developing fruit rendering it unmarketable. Monitoring: Consult scouting records from previous years to determine if build-up of this disease is indicated. Monitor weather conditions to identify likely infection periods. Scout fields beginning at budbreak for symptomatic tissue. This timing often coincides with Fortsythia bloom. Plant resistant varieties whenever possible. Those that are most resistant to the shoot blighting phase of the disease include Bluejay, Darrow, Duke, Elliot, and Toro. 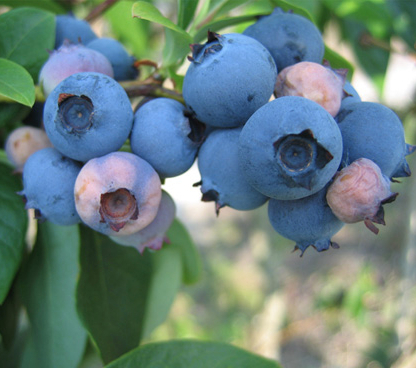 Cultivars that are consistently resistant to the fruit infection phase include Northsky, Reka, Northblue, Bluegold, Bluejay, Weymouth, and Patriot. 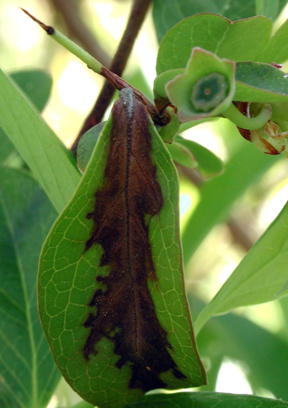 Resistance to fruit infection appears to be unrelated to resistance to shoot blight, and weather factors can also affect cultivar response to the disease. Prune bushes to open the canopy to light, air, and spray penetration. Cultivate beneath plants in fall and again in early spring to disrupt overwintering inoculum. Apply a 3-4” layer of mulch material over the soil surface in early spring before mushroom cups emerge to create a physical barrier to spore release. Apply recommended fungicides at budbreak if scouting and weather monitoring indicate risk of infection. Time fungicide applications closely to frost/freeze events that predispose tissue to infection. Repeat fungicide applications at recommended intervals if weather conditions are conducive to infection. Rotate fungicide materials from different FRAC groups to avoid promoting the development of resistant strains of this disease. Copyright © 2015 UMass Extension, All rights reserved.